In theater, the actors who play Peter Pan are young, sprightly, and almost always female. 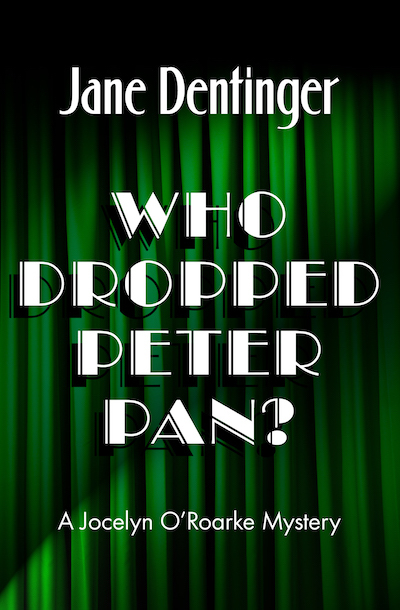 So you can imagine the surprise of actress and sometimes-detective Jocelyn “Josh” O’Roarke when middle-aged director Rich Rafelson decides to step into the harness of the boy who never wanted to grow up for a regional production of Peter Pan. Even more surprising is Rich’s sudden death, caused by a fall from the stage during an ill-advised curtain call. Josh’s friends who had been in charge of the harness and stage carpentry are now prime suspects, and she has to clear their names. Complicating things are rival former lovers battling not only for Josh’s affections, but for the resolution to the case. But as Josh gets closer to the truth, a fairy tale ending seems ever farther away . . . Who Dropped Peter Pan? is the sixth and final book in the Jocelyn O’Roarke mystery series, which begins with Murder on Cue and First Hit of the Season.